This is the form Rex takes when his demon half has been temporarily nullified, bares more resemblance to his mother, minus his fox tail and belly fur which takes on a much paler color than normal. Same personality as normal, though may be slightly more aggressive if he feels threatened, Can often be seen grooming himself like a typical house cat, although he does it in demon form too, mostly as a cub because his feline half is still a pretty strong part of his personality as a child, He does it way more in this form being mostly feline than demon fox. 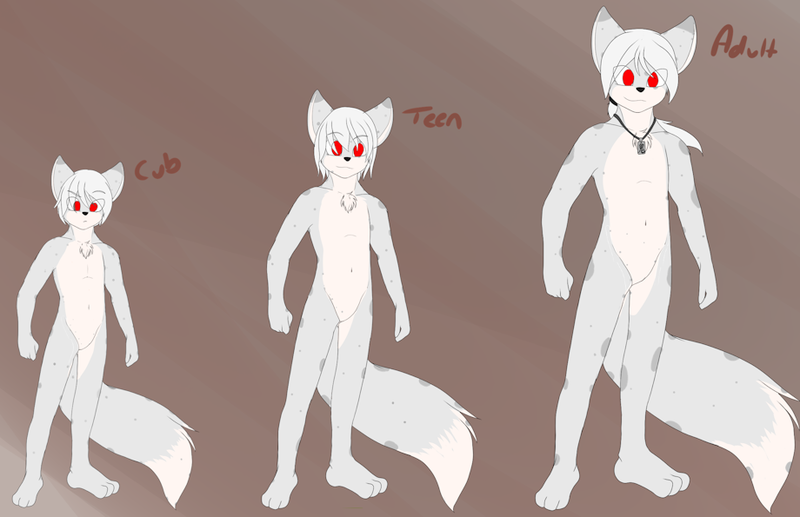 Rex was initially born a snow leopard, his demon fox half didn't develop until he turned 5 and eventually changed him into a demon fox, this form is a combined version of his demon and feline half where his feline half is the more dominant outer appearance. Doodled this up for fun, thought it would be interesting to see what he looks like in his partial snow leopard form for once lol. ^^ big bro is so cute. I wanna hug him. We can be snow leopard bros. I'm John Cleese, and now for something completely different. His demon half is what kept his vamp half in check (His thirst for blood, sensitivity to light,) so hes more vamp than demon in this form meaning, he has to feed on blood more often in this form and sunlight doesnt kill him but it will give him one nasy sun burn if exposed for too long, and without his demon half hes a lot more vulnerable to damage to his body lol.